Treetops Traditional is renowned for its exceptional quality sheds. 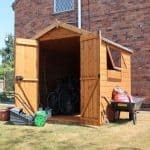 This security shed is one of the more superior options in the range and it comes with a long list of impressive features. It is designed specifically with security in mind so compared to standard sheds, this does have a few stand out benefits. The windows are one of the key security features. There are 4 fixed windows added to one side of the building. However, what sets them apart is their size. They are incredibly small and located high up on the shed. This makes it hard for anybody to see in, adding great privacy whilst still allowing some light into the shed. It also comes with a heavily framed door. It benefits from thick, rigid bracing and is hinged in three places so you never have to be concerned with sagging. It also has a wide design, making it easier to manoeuvre bulky equipment through the door. There is also an integrated, key operated lock with a shielded padlock protector. However, a padlock isn’t actually supplied so you will need to buy one separately. Constructed with exceptional quality Redwood Shiplap tongue and groove, this shed is not only secure, but it’s stylish and durable too. Although typical on sheds of this price range, the felt is fairly thin. So it is recommended that you find a better quality felt and install that in order to match the quality of the rest of the building. This is a very high quality security shed, designed to hold all of your valuable equipment and tools. It comes with an exemplary tall height, making it easier to store taller items, as well as ensuring maximum comfort when using the shed. Even its door height is impressive compared to a lot of competitor models. Treetops Traditional sheds don’t tend to come with very tall doors so at 6’1” the door height on this model definitely stands out from the rest. It also has a large door width, making it a lot easier to transport bulky items in and out of the building. 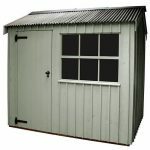 As with all of the sheds introduced by this incredible manufacturer, the roof and the floor are constructed with thick 12mm tongue and groove. This enhances the longevity and stability of the shed and guarantees extraordinary quality. The roof has an apex shape, making it tall and resistant to rot. Rainwater never has a chance to collect on top of the roof as it is quickly directed down and away from the building. It is also covered with a mineral felt for added protection. This is fairly thin however so some customers have found it beneficial to buy a thicker felt elsewhere. The floor benefits most from the tongue and groove construction. It is both sturdier to walk across and strong enough to hold any weight. So there are no restrictions on what you can keep in this security shed. It is the type of timber used to construct this shed that is really impressive. Its stylish design is credited to the high quality Deal Redwood Shiplap tongue and groove. Redwood isn’t commonly used by most manufacturers so this shed does have a different design compared to its competitors. Hit is also PAR finished which means the manufacturer actually started with 16mm timber and planed it down to 12mm. This gives a much smoother, attractive appearance. Whilst the type of timber used is different, the benefits that come with Shiplap remain the same. Each panel features a small indented groove that drains rainwater off the walls, reducing its chances of soaking through to the wood. This again enhances its rot protection. There is also an expansion gap, albeit a small one, that allows for any seasonal changes in the timber without compromising the stability of its structure. A 44mm x 27mm frame is used to ensure the shed is extremely stable and capable of withstanding harsh, strong winds as well as daily wear and tear. A dip treatment is applied at the factory and this does leave a strong surface barrier that will protect the timber throughout delivery. However, it is advised by the manufacturer that you apply a further high quality treatment within 6 weeks of installation and then annually to top up its rot resistance. The single, heavily framed door of this shed cannot be moved. This is unusual as Treetops Traditional tend to offer a wide range of customisation options with their sheds. However, it isn’t really a disadvantage as the many other outstanding features of this building ensure you get maximum value for money. The door has a wide design, helping you to fit all kinds of tools and equipment inside. The fact it is hinged in three places and thickly braced means it benefits from superb quality. The shielded padlock protector is also a unique addition of this building, though you will need to buy your own padlock if required. There are 4 fixed glass windows added to one side of the shed. You may think this is strange for a security shed but if you look at the picture you’ll see they are actually really small. They are also located higher up the building which means they won’t be easy to peer through. As security and privacy are the main two factors focused on in the construction of this shed, it’s no surprise to see some impressive security features added to the building. For example, the door is fitted with a key operated lock and as mentioned it also has a shielded padlock protector if you decide to add a padlock to the building. The windows included in its design are also very small and difficult to see through. 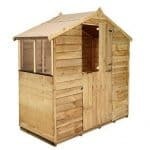 Add to this the thick Redwood cladding and you have one of the most secure sheds available to purchase. 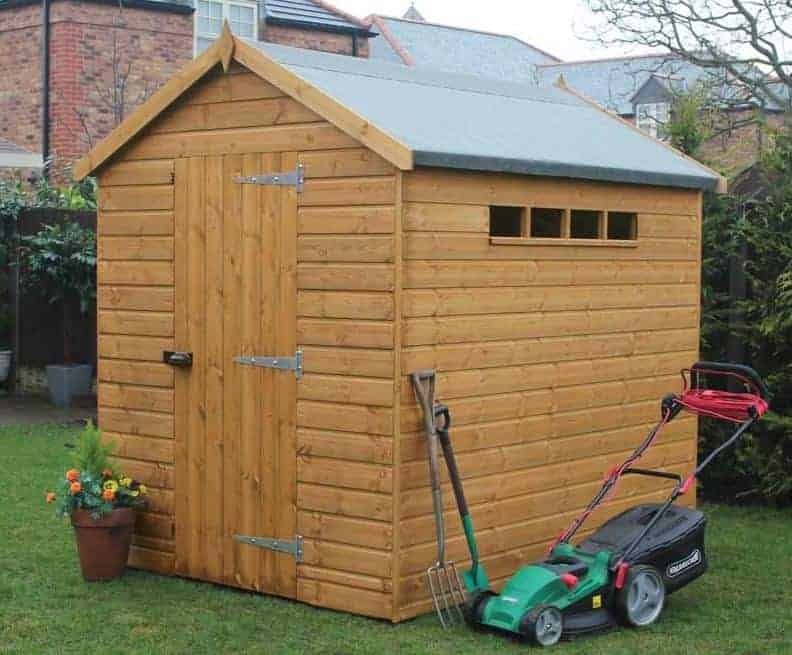 You aren’t given a lot of extras with this shed but that’s because put simply, you don’t need them. The manufacturer has made sure practically everything you could need or want from a security shed is provided in the standard design. What you are offered is floor bearers and an installation service. The floor bearers are something we do recommend. They literally just look like little sticks, but they have been treated so they last for many years to come and they provide a very important function. They work by lifting the floor of the shed off the ground, ensuring damp doesn’t soak through and cause rot and fungus. This therefore improves the shed’s longevity. So for something so affordable, it would make sense to take advantage and add these to your purchase. The installation is great if you really don’t want to take the time to put it together yourself. 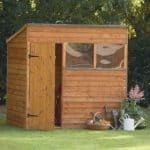 However, the great thing about sheds created by this manufacturer is that they are very easy to assemble. So it’s more a matter of personal preference whether you choose this installation service or not. We literally can’t fault anything in the quality of this shed. Even the very minute details have been developed with exceptional quality in mind. If treatments weren’t required we could have given this building a 10/10 for longevity. Its materials are exceptional quality and its design ensures it can withstand almost anything that it thrown at it. The width and depth of the shed offers a good amount of storage, but it is the height that is most impressive. 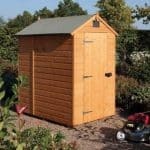 Allowing you to store taller items, this shed does offer plenty of storage to suit most people’s needs. Due to the solid construction of Treetops Traditional sheds, they do tend to be some of the easiest to assemble. This model is no different and it shouldn’t take too long to construct. 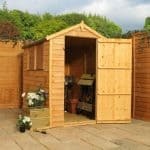 Its cost may be a little higher than similar sized sheds, but the value for money you are provided with is fantastic. It gives you so many benefits and it is guaranteed to last for a long time to come. Final Thoughts: As far as security sheds go, this is one of the highest quality models on the market. Treetops Traditional is an extraordinary brand, offering incredible quality. This model features very tiny windows which allow light into the shed, without compromising its privacy. The door is secured with a key operated lock and is also heavily braced. The building is constructed out of Redwood Shiplap tongue and groove cladding and is guaranteed to last for many years. We’re highly impressed by this shed and are positive you will be too. So if you’re looking for a safe, private place to store valuable equipment and tools, we highly recommend this superb model.